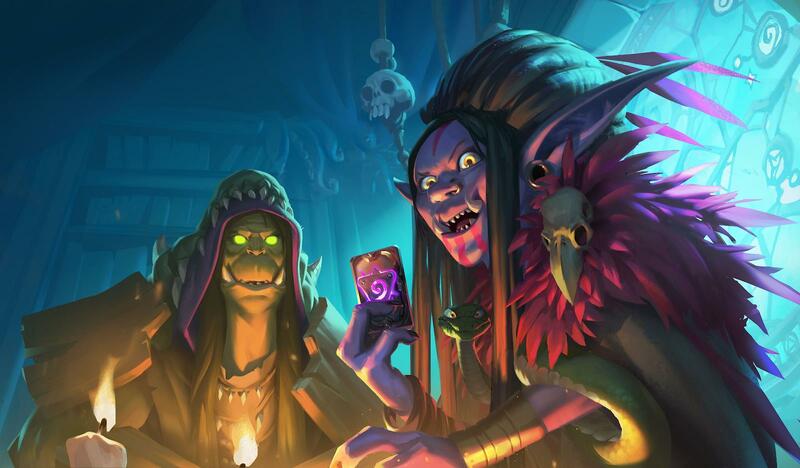 Hearthstone’s latest expansion, Rise of Shadows, has been announced with an E.V.I.L. 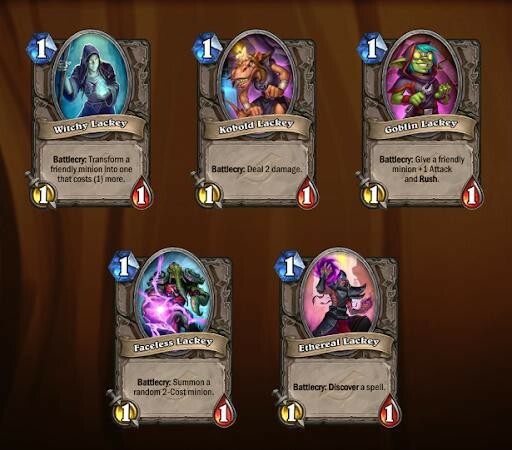 theme, featuring villains seen from previous expansions: Rafaam, Dr. Boom, Togwaggle, Hagatha, and newly-introduced Priest hero Madame Lazul as the League of E.V.I.L. 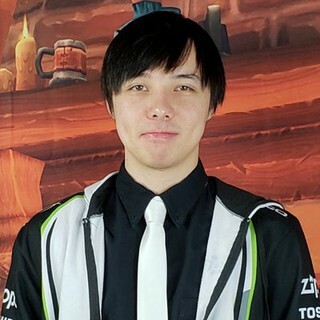 The expansion will be the first set in the Year of the Dragon, and it will surely shake up the meta following a standard rotation change and a Hall of Fame change after it releases in early April. In the Rise of Shadows announcement trailer, a few new mechanics were introduced as Blizzard works through revealing the first wave of cards. I'm going to break those new mechanics down for you. 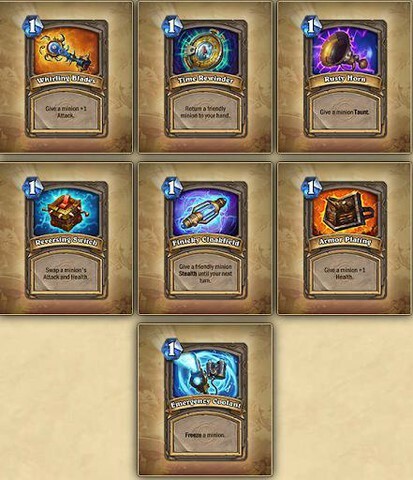 Lackeys are new token cards you can generate starting with the new card set. There are five different types of these 1/1 lackeys, each with a different battlecry. 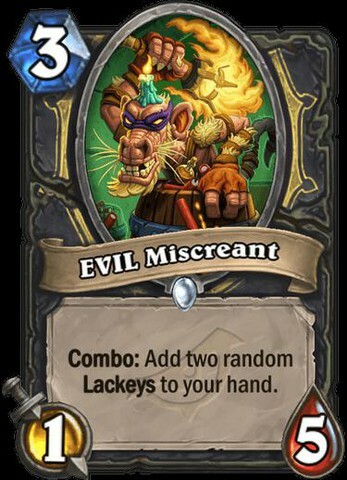 The first lackey card introduced is EVIL Miscreant, whose combo effect generates two random lackeys for you. 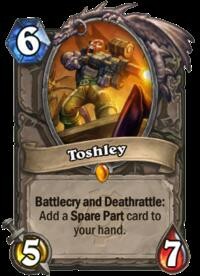 In previous expansion Goblin vs Gnomes, some cards, such as Toshley, would generate one-mana minion buff spells known as spare parts while making minions on-board stronger. It was strong, and it resulted in many new synergistic combos. The primary difference between these new lackeys and GvG’s spare parts is that they’re 1/1 minions rather than spells. 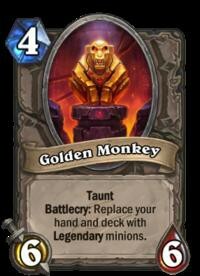 Their battlecry effects’ power levels are stronger than GvG, since the effects include mechanics such as Evolve and Discover that significantly outweigh mana costs. For example, one of the lackeys you can generate randomly, Faceless Lackey, is a one-mana 1/1 body that summons a random 2-drop. You are paying one mana for a three mana value. Scheme cards, on the other hand, are mostly spells that upgrade each turn and grow stronger over time. There are currently three scheme cards revealed. 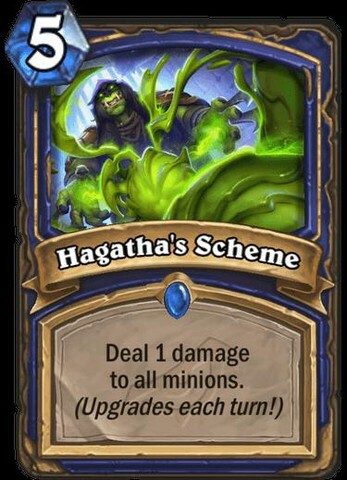 The easiest example of a scheme card growing stronger would be Hagatha’s Schemewhich becomes a stronger board clear with each passing turn. This mechanic seems promising, as upgrading spellstone cards in Kobolds and Catacombs were similarly powerful. The scheme mechanic of a card depends on the turns held in-hand. Twin spell, like the name suggests, allows a spell to be cast twice, where the second spell can be withheld to be cast at any turn, but cannot be multicasted again. This is similar to the “echo” mechanic, which allows you to cast a card multiple times in one turn. 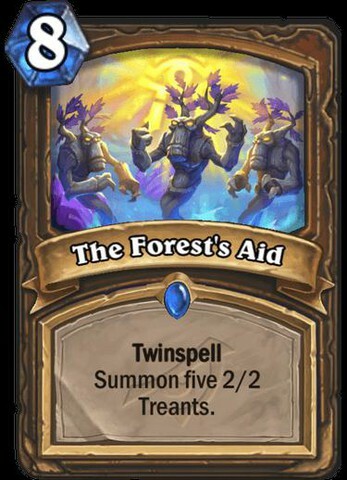 So far, the one example with this mechanic is Forest’s Aid, which allows you to summon two sets of five 2/2 treants at different turns. It is a simple mechanic overall, similar to echo, that generates value in your deck and depends on the effect of the card to be powerful. One unique thing about this mechanic is that you can hold back the second spell cast for a different turn, depending on the situation of the game. 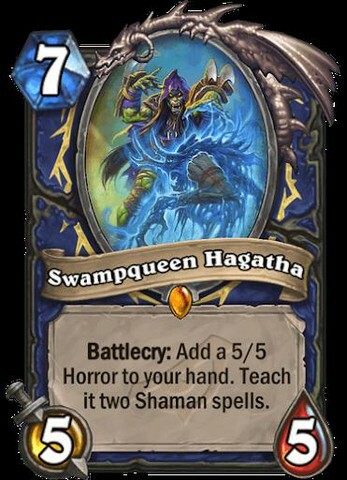 Swampqueen Hagatha was introduced recently with the new word “Teach” in its battlecry, which allows you to teach your minion a spell, or spells, to cast. This could be exclusively a legendary battlecry mechanic, but that is yet to be known. I expect more of this mechanic to be revealed, though, where minions are combined with multiple discovered spells to cast. Arch-villain Rafaam’s battlecry is a reproduction of a card from League of Explorers, the Golden Monkey. Their battlecries are identical: “Replace your hand and deck with legendary minions.” It seems more signature powerful effects from previous expansions may also return in this fashion. 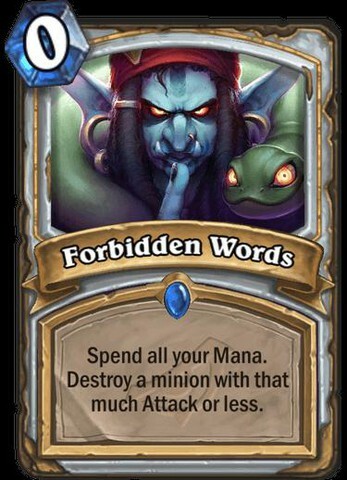 The “Forbidden” spell mechanic, which was introduced in Whispers of the Old Gods, is brought back to this set as a repeating theme and familiar mechanic, as seen in the new priest card Forbidden Words. 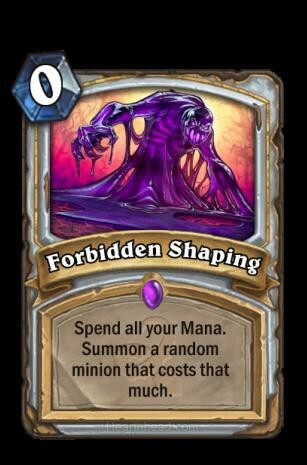 “Forbidden” spells were spells that spent all of your remaining mana in a turn to cast an effect with power based on the mana expended. 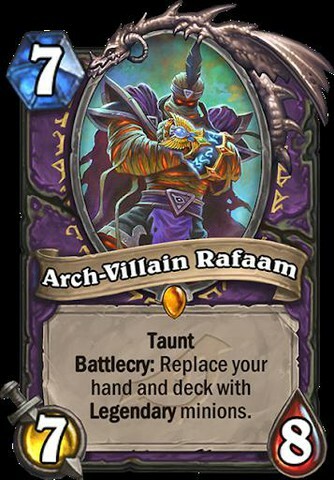 Rise Of The Shadows, so far, seems like a nostalgic train ride back to the past, with mechanics loaded with nostalgia, like “forbidden” words and Arch-Villain Rafaam. There’s no shortage of new mechanics to play with, though, and that means there’s a whole world of new strategies to create, craft, test, and, hopefully, win with.